We want to share information about local fish and seafood with you here. We will be posting details of local fishing businesses; restaurants and cafes, fish and chip shops and vans and those selling fresh 'wet' fish for you to enjoy! Please get in touch if you would like to list your business on this page. The picture on the right shows a rough guide to which fish are caught in which season here in north Devon. As we are dealing with nature and the weather the catch fluctuates from season to season, year to year. For instance in some years Clovelly herrings don't turn up until November. 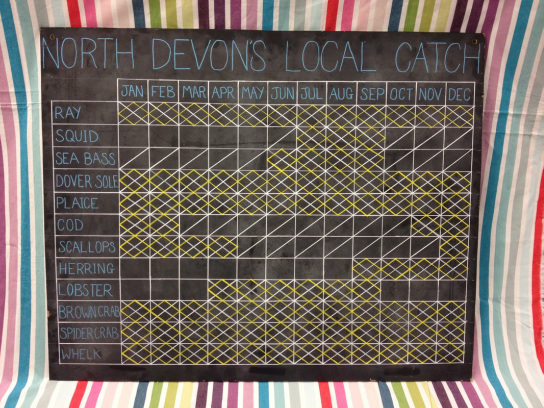 If we hear anything interesting about our local catch - we'll let you know. A temporary ban on landing ray from the Bristol Channel (October 14) meant that some of our fisherman went south. But they came back - they have some quota & the fish shops are open. And in North Devon there are several small day boats out fishing -catching bass or Clovelly herring for instance with the season. We have local lobster & crab fishermen working from Ilfracombe to Hartland -some selling individually from the boats. We also have individuals like Phoebe Chope selling Torridge mussels & oysters grown in the Torridge estuary. And as well as the wet fish shops, we have new street sea food outlets, like Seadog operating from their red trailer & Glorious Oyster from their horsebox, selling a delicious variety of seafood delights to tempt you out into the sunshine. Contact details for all these businesses if you scroll down. Please support your local fishermen & retailers and keep asking for local seafood! Thanks to Hattie at northern Devon FLAG for permission to use her board. Many people lament that you can't buy fish directly from the boats any more. In Clovelly you can buy herring or lobster in season, directly from this Clovelly born artisanal fisherman. Stephen Perham fishes for herring in the traditional way on a small picarooner - using either oars or sail. Stephen, his picarooner & members of his family star in our film Fishing for Clovelly Herring. For those a bit further from the sea, Dave Gabe travels from Appledore to sell fish and shellfish at South Molton pannier market on Thursdays. Find him at the car park end, next to the pet stall. Dan is the fishman to go to for ideas on how to cook your local fish, simply and easily. If you’re lucky he’ll even show you how to do it for Dan is often found giving cookery demonstrations from his colourful stall at local festivals and events. Dan’s passion is sourcing and cooking local fish and if you’re not in a hurry, he can probably tell you which boat your fish came off and a story or two. Hartland – first Sunday in the month until the end of September or by arrangement at Appledore Fish Dock. Phone Dan first to agree a time. Butchers Row, next to the Pannier Market in Barnstaple, is a shopping experience in its own right with a scrumptious bakery, Deli packed with local cheeses, veg shop, butcher and of course Passmores fresh fish. Local fish and shellfish are sourced from Appledore Fish Dock and directly from boats in Appledore and Ilfracombe. Passmores, 9 Butchers Row, Barnstaple, EX31 1BW Tel 01271 343677 is open Tuesday to Saturday, shuts early Wednesday and Saturday afternoons and also has a mobile fish van. The Sparkling Star from S&P trawlers stars in our film Fishing for the Long Haul & Clare manager of S&P fish shop has a cameo role in the film! Please check with the shop for opening times. To read more about S&P click the button below. Geoff Huelin who pots for crabs and lobsters from his boat 'Our Jenny' through the summer months and whelks in the winter is the star of our first film 'Lobster Potting & Berried Hens.' 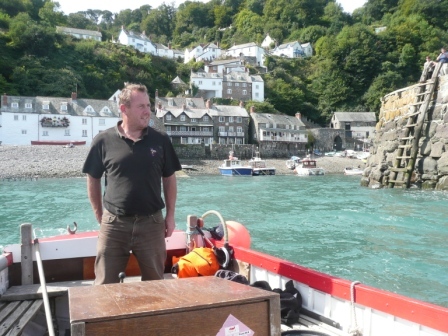 Watch it on our films page and you'll see how Geoff who followed his father into potting uses traditional methods, is a strong supporter of the No Take Zone around Lundy island and an advocate for sustainable fishing. Walrus Fisheries, managed by Jenny Huelin supplies local businesses, restaurants and private customers with live catch and delivers locally. 01271 867206. 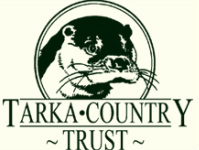 To find out more about this local, family, sustainable fishing business, follow the link below to the films & blog.